I spend my free time poking around churchyards. I'm looking for the interesting headstone, the jaw dropping epitaph, a tear jerking message or just some drop-dead gorgeous lettering. Now I realise that variations of that verse can be found in every churchyard in the land, but the message still carries weight. I didn't know the term then, but I read it simply as a Memento Mori. Be prepared. You too will die. But there is a religious message in that doggerel - 'be prepared' means, 'get right with God or bad things will happen'. Well, spoiler alert, there is no God. Someone made it up. Yes, Poor Frank Raw is an atheist. Having looked at all the evidence for the existence of a God - one God or many - I see none. I can't prove a negative, it is up to the believers to try to prove their positive, and so far, I'm not feeling it. But that leaves me with a problem. There I stood the other day, in church, at a friend's funeral. 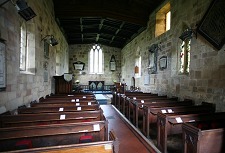 A tiny village church in soft yellow sandstone, with every pew and every inch of standing space packed with grieving family and friends. I knew the hymns, I knew the prayers and responses, I knew the format of the service, conducted with great sympathy by an excellent vicar. We stood or sat as the space allowed and took part in a service - a ritual - which has been followed in that small church for hundreds of years. Our lovely friend Tom was seen to his rest with all the reverence and dignity he deserved and the CofE was the vehicle for that journey. While we cried salty tears to see Tom's grieving widow supported for the first time in 60 years on an arm other than her husband's, we, the congregation, enjoyed 'a good funeral'. It all went like clockwork - the church does these things very well. They did him proud and then we all went to the pub. I had a close look at the exit ramp myself a year ago. Given the good work of a great surgeon and the massive NHS team around him, I'm still above ground and hoping to stay that way for some time. But for a while it was ugly. Ugly enough to turn my mind to what kind of funeral I might want. So how does this atheist unbake the cake? How do I pick out the cultural - which I love - from the religious - which I don't? The local crem can't compete with the village church for atmosphere, history or sheer cultural gravitas. While a personal favourite, "Always Look on the Bright Side of Life" doesn't have the same throat grabbing power of Verdi's Requiem or the calm certainty of "I know that my Redeemer liveth". And then it hit me. It's OK. I'll take the crem. I'll leave a CD of my favourite, irreverent and wry tunes suitable for an atheist's funeral. You can keep the grave and the "sure and certain hope of resurrection to everlasting life". I'll even forgo a nice slate headstone which would sit in the shadow of that gorgeous church for centuries to come. Our friend was born, lived, worked and died within walking distance of that church and it was the right place for his final rite of passage and his eternal rest. But the most important part was the people who came along. I want a funeral like Tom's. Not the building, not the music, but the company of a few caring people who will laugh, cry, eat and drink in good measure. If any of us achieve that then we will indeed have had a good funeral. So be prepared.